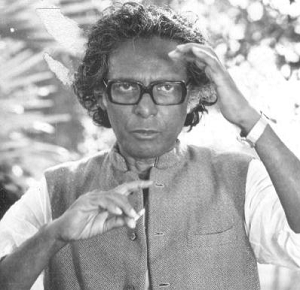 The uniqueness of the director Mrinal Sen is that he is the first Indian filmmaker to use multimedia elements in his films. These includes among others, documentary and newsreel footage, stills, ad films, montages, animation, voiceover narration, virtual conversation, radio broadcasts, artworks, cartoons, typed headings, graffiti, innovative sound effects with playful and novel camera techniques, editing (Jump Cuts), textual references, expressionism and symbolism and elements of fantasy neatly woven to break the monotonous storytelling penchant seen in most revered desi filmmakers, seamlessly integrating all these elements into the narrative without ever losing his grip on the core content. In that sense, he is the first ‘Multimedia Artist’ in Indian cinema. The success in incorporating such devices into the filmmaking process can be seen in a film like ‘Padatik’ (The Guerrila Fighter, 1974) where in spite of the work being based on a subject of introspection on the violence of the Naxalites, the film eschews depiction of physical violence on screen conveying the dark times and the mood effectively through some of the above mentioned elements. The use of such techniques can be seen once in a while in the works of other Indian filmmakers as well. In the recent film ‘Dhobi Ghat,’ for example, director Kiran Rao uses a video replay as a recurring technique to advance the unfolding of a particular strand of the story. I am not sure whether Kiran Rao has seen any works of Mrinal Sen, or what her inspirations are, but MS had started using such techniques about four decades back. He has experimented with different narrative style. From the straightforward narrative in his early works (Neel Akaser Neechey, Baisey Shravan), he moved to the episodic format (Calcutta 71), quasi-episodic ( Chorus), oscillatory (Ek Din Achanak) and the de-emphasis on the complete story in his introspective films (Ek Din Pratidin, Ek Din Achanak, Mahaprithibi & Antareen). Talking about narratives obviously brings the question about the relationship of cinema and literature. Here is a thought of the filmmaker on ‘cinema and literature’ as he had once said in an interview. Sen refused to accept the fact that cinema is overawed by literature. By his own admission, Sen never based any film of his on some great literary piece of work. Neither did he translate any literary work in his films. Yet he never moved away completely from literature. The joyful elements of literature have always attracted him more than any other elements of literature. A synopsis of a literary work is sufficient for him to develop and give his own interpretation in a cinematic form. According to Mrinal, cinema is a joint art form. One that can be called crystallized art. Because cinema is a new art form, it borrows ideas from older, established art forms and carves its own road for progress as a medium. The wide-ranging experimentation of this auteur could easily form the reason to confer the moniker ‘Godard of Indian Cinema’ rightly on this nonagenarian filmmaker.